Ranked as one of the nation’s top health and fitness clubs, Zenergy at Thunder Spring in Ketchum has a long list of offerings for staying active—and they’re not all for adults. Kids at Zenergy’s summer camp enjoy a myriad of activities, including swimming, tennis, yoga, Zumba, squash, golf and fishing. The camp is open to children ages 4-8. It runs from June 9 to Aug. 15, Monday through Friday from 8:30 a.m. to 1:30 p.m. Kids attend the camp on individual days or a week at a time. Heather Miller, a certified elementary and special education teacher, as well as an avid triathlete, directs the activities. The camp starts at the Community School in Sun Valley, where kids work on arts and crafts and can play on the school’s playground and grass lawn. At about 10:15 a.m., counselors will take kids to Zenergy for pool time, snacks and the primary activity of the day. Pre-registration is required. Early bird rates expire May 7. Advanced youth tennis players ages 8-17 will want to investigate the Peak Performance Tennis Camp at Zenergy, with coach George Maurtua. Weekly sessions are scheduled for July 7-11, July 14-18, Aug. 4-8, Aug. 11-15 and Aug. 18-22. 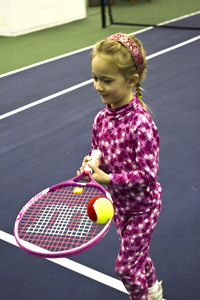 For pricing and registration information on these activities, call 725-0595 or visit www.zenergyts.com.